Huh. When I posted the latest Village Backdrop-review in my attempt to catch up with the series, I noticed that, while I had access to this village’s files, I never actually downloaded them or wrote a review. Weird. Anyways, since I am a completionist and pretty OCD regarding the like, here we go! Byrnfort’s pdf clocks in at 11 pages, 1 page front cover, 2 pages of advertisement, 1 page editorial/ToC, 1 page back cover, leaving us with 6 pages of content, so let’s take a look! Byrnfort is situated in the ancient Barainwood, and its frontier-status in a hostile wilderness becomes immediately apparent to anyone who sees it: With thick walls of timber and sharp stakes encircling the village (lavishly mapped by Maciej Zagorski), it is obvious that this place, hunched and somewhat claustrophobic, is a refuge from the horrors out there – but not necessarily one that can withstand all that is out there. More a fortification that a village in the traditional sense, the local dressing habits and “industry” mirror this reality, and so do the community leaders, who hearken to the nature-themed side of things. We get a sample marketplace section here, and, as always, village lore for smart PCs to unearth as well as 6 sample whispers and rumors. The local inn, the Stout Draught gets its own little notes on the price of food and accommodation. Cool: There is a charhouse, which fabricates specialized alchemical coals, three of which are provided. These include one that potentially helps with poison at the cost of being sickened. I really like how flavor and mechanics are married here. The events do hint at something more going on here, and indeed, there is a secret society of sorts, the Green men – who have a pact with a rather deadly fey ghost. As such, they are obligated to conduct strange rites, of which 6 are provided, adding further flavor. Editing and formatting are top-notch, I noticed no glitches. Layout adheres to Raging Swan Press’ elegant 2-column b/w-standard and the cartography, as always, is excellent. The pdf comes in two versions, one optimized for screen use and one for the printer. They are both fully bookmarked for your convenience. 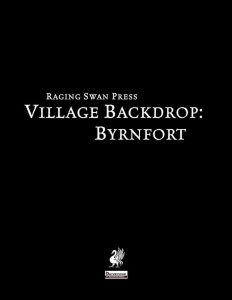 My apologies to author Amber Underwood for missing this nice village previously; Byrnfort has a cool, almost Twin Peaks-y vibe going on, and the emphasis on coal and the like is a seldom seen or developed aspect in villages, which adds a sense of authenticity to the village. The rites are really cool and further add local color to the place. So yeah, all in all, I found myself really loving this one! My final verdict will clock in at 5 stars +seal of approval. You can get this cool village here on OBS! You can directly support Raging Swan Press here on patreon! I was kind of wondering if Byrnfort had slipped through the cracks! Glad you liked it. I’m a big fan of creepy cults, and the concept of a coal making alchemist really appealed to me; normally you see potion focused alchemists, but alchemy is way more than that.